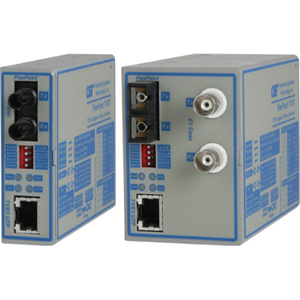 The FlexPoint T1/E1 is a modular T1/E1 copper-to-fiber media converter that provides reliable and cost-effective extension of devices such as PBXs, CSUs and routers via fiber. Designed as a transparent repeater, the FlexPoint T1/E1 supports standard T1, E1 and Primary Rate Interface (PRI), voice or data. The converter also supports AMI, B8ZS and HDB3 line codes. Manual switch settings with on-the-label descriptions enable easy configuration of T1/E1 line codes and line lengths. A crossover switch makes it simple to connect the FlexPoint T1/E1 converter to PBXs or CSUs and eliminates the need for crossover and custom cables to connect devices. The fiber port operates at 1310nm and supports SC or ST connectors. Multimode fiber models support distances of up to 5km, and single-mode fiber models support distances of up to 60km.